SIT a.k.a. "Support Information Tool" is a program to edit the support information in Windows. IT companies can leave their (virtual) company stamp on the customer PC with just a few single clicks. Just click apply and support information are stored. The function "Copy Logo" copies a logo from the "Logo path" to any directory, so that it is stored centrally and can therefore always be displayed in the system properties. If the logo loaded from an USB stick clicking on "Apply" would write the USB stick path. When removing the USB stick the image is not displayed in the system properties anymore. If selecting the checkbox "Copy logo" a dialog will be displayed when clicking "Apply" to store the logo in a regular filesystem path. SIT supports multiple languages. SIT does not need to be installed and is compatible with Windows 2000 and later. SIT has been digitally signed. 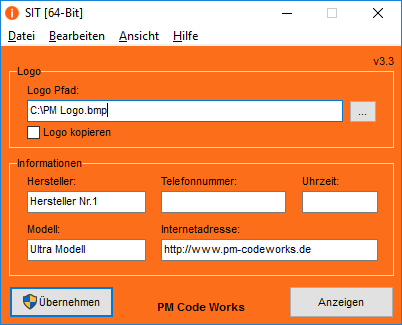 To verify the signature the certificate of PM Code Works must be installed.